there are some people in this handmade/blog community that just blow me away. moriah is one of them. she is full of grace, kindness, encouragement, talent, beauty, and i love reading about her adventures as a mom. 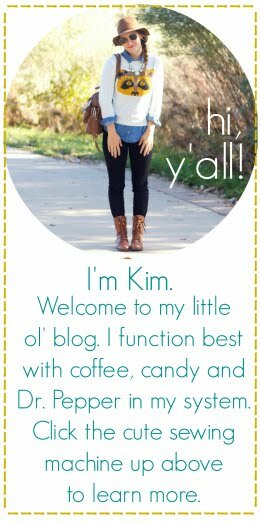 her blog is a constant pick me up, whether she shows an adorable video of her sweet baby boy or a favorite etsy shop. her heart for handmade is so evident and i love that. her shop & blog are both entitled, josiah's nest! i have this necklace from her shop & am so bummed i left it at home. it's such a fun necklace! 1. head on over to josiah's nest & leave a comment with your favorite item from the shop. Check your link to her shop. I tried to go there and one would not work, the other showed her banner with "no product found." The links aren't working, but I really like both the necklace AND the headband! :) Cute! link didn't work, but that headband is adorable! But I love that ruffled flowers headband! I can't get enough of headbands! Link did not work but I love the headband!! i really love the headband she is giving away!! the colors are sooo pretty! yea, the link didn't work for me, but i think both of the items you have featured on the page are very cute! No link :( But I really love her necklaces I have wanted one with some black in it. I love her stuff. Very cute necklaces and so many awesome colors!! Still facebooked! Love the fabric knot necklace in torquoise, facebooked it as well. I'm bummed the link didn't work, but I love the items you featured here! So cute! I love Moriah too! She's how I found you and I can't even remember how I originally found her! :) Her beaded necklaces are just too cute!! I've always wanted to buy something from her, but just never have. So this could be my golden opportunity! 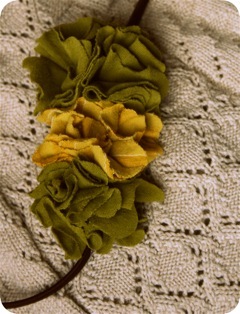 I love the triple flower headband in pistachio and mustard. Adorable. love her necklace and I love her blog a ton - I am a follower of hers because of you! The link to her shop wouldn't work, but I love love love this cute headband!! The upper link to her shop worked for me! But there's only one item in her shop right now--so it's good that's it's green because green items are usually my fav! love the giveaway headband...such a perfect blend of colors! I've seen her cute fabric knot necklaces, and I love them! The link didn't work but I'm sure anything is adorable! Link didn't work for me either, but I love that headband, and have been a fan of her necklaces for a while now! The headband is so amazing! Love the colors! the giveaway headband is adorable...and those are some of my favorite colors! only able to view the headband! regardless I love her style! I love the headband! I wish I could see more of her creations! The headband is so cute! Great choice! Love the colors on that headband! 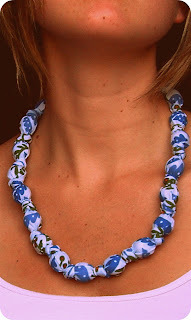 Love the blue necklace (links did not work for me when I tried them either)! I LOVE Moriah!!! Everything she touches is adorable! ahhhh! i want the green headband! it would look so good for Fall! Moriah has great taste!! The headband is super cute- perfect for fall!! :) And the beaded necklaces are such a great idea! cute felted flowers on her blog! Love the headband! such a cute headband! and i love her necklaces. The link wouldn't work for me, but I love the headband! I love the headband featured! love the headband she's giving away! Too bad I couldn't see more of her items, the link was being naughty. But I do love the headband you posted about here! AMAZING headband - and in my fave colors! count me in! hmm... i'll have to try looking again later. but very cute necklace and headband! The shop only has one item - the headband. loving the headband that's up for the giveaway! love the headband up for grabs! i have two necklaces on the way, and i really want that headband too! moriah is such a doll! love her! All I can see is the headband, but it's really pretty! i love the headband but i can't wait till she gets more necklaces listed!! I adore the headband that is part of the giveaway! Love that headband. The colors are awesome. Love the headband...and your necklace is AMAZING!! !